Michael Thomas came out of retirement to start another career. The Phoenix, Arizona, native spent 20 years in the military, joining the United States Air Force Academy straight out of high school. He retired as a lieutenant colonel in the summer of 2016. Now, Thomas is a graduate student pursuing his master of public administration (MPA) in the School of Planning, Public Policy and Management (PPPM), expecting to complete his degree in June. He is one of several veterans that walk the halls of the College of Design, as students, faculty, and staff. Veterans Day, Sunday, November 11, is important to Thomas because it’s one of the few times a year that people are collectively thinking about the service and sacrifice of veterans. “People are actually remembering the military at the forefront of their brain,” Thomas said. 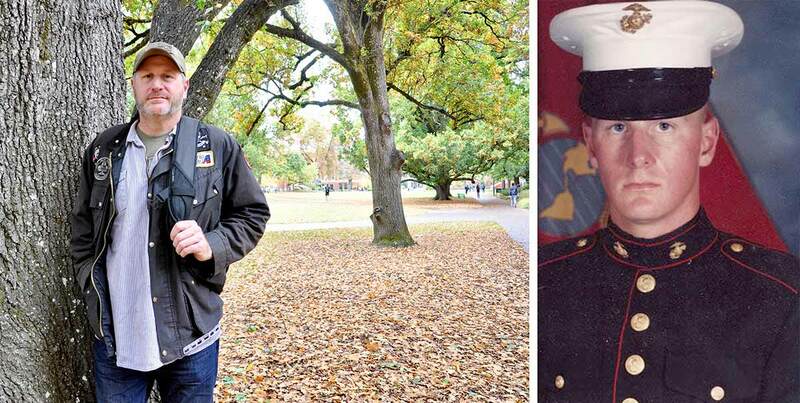 We caught up with many of the veterans of the College of Design community to see how their public service has shaped their university experience. Thomas is also a graduate employee as the Veterans Program coordinator for the Office of the Dean of Students. 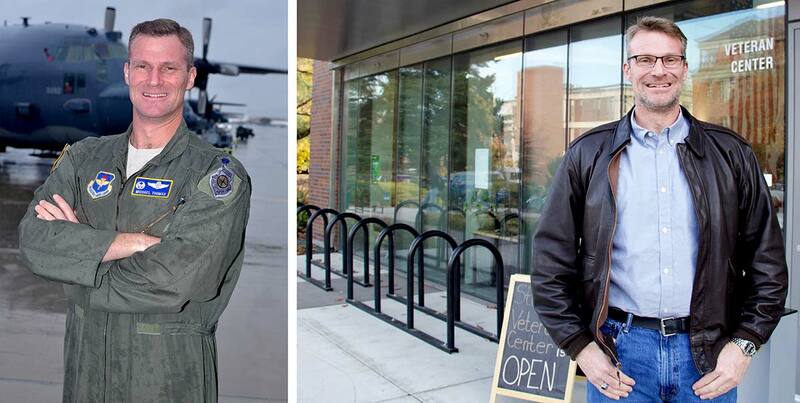 When not taking classes, he works out of the Veterans Center in the Erb Memorial Union. Before coming to Eugene, Thomas, through the Air Force, traveled to 36 states, three U.S. territories, and 38 countries. He lived in Japan for four years. Thomas spent much time in combat, from enforcing United Nations-sanctioned no-fly zones over Iraq to flying over Bosnia and Yugoslavia to War on Terror operations in Afghanistan and the Philippines. He also worked on counternarcotic operations in South America. “It was an enjoyable 20-year career. It was fun flying while it lasted,” Thomas said. Upon his retirement from service, he decided it was time to reinvent himself. “I like the idea that [College of Design] seems at the forefront of sustainability, environmental awareness, and adaptability to new technologies,” Thomas said. He has completed internships with the Sustainable Cities Initiative and the City of Eugene. His goal is to become a city manager. Thomas said his military background has helped him navigate academic stress as well as excel at time management. “I think all vets have that ability, because we learn so quickly in the military to prioritize things and get things done in a set order,” Thomas said. On the flipside, he said, becoming a student after a decades-long career has its challenges. He’s not as savvy with the relevant technology as some of his younger counterparts. Being with his cohort has led him, and his fellow students, to confront stereotypes about one another––which he said builds a stronger, better community. 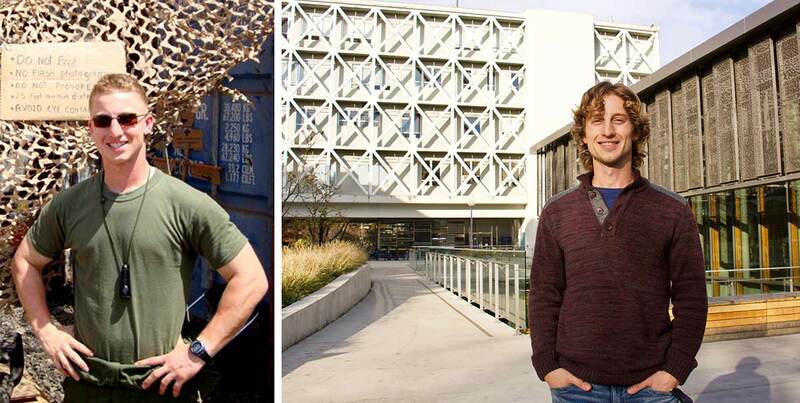 Read more about veterans in the College of Design below. Originally from Caracas, Venezuela, Vanessa Pellegrino moved away from her family at age 13 when former president Hugo Chávez came to power. She joined her aunt in Boston. After completing her undergraduate degree in business administration and economics at Plymouth State University, Pellegrino joined the Air Force shortly after becoming a U.S. citizen in 2012. “It was kind of like giving back to my adopted country,” Pellegrino said. She spent five years as a medic focused on pharmacy at the flagship hospital on the Travis Air Force Base in California, where she managed personnel and did pharmacy administration and analytics. After her service, Pellegrino knew she wanted to go back to school, and chose architecture, having grown up in a family of architects in Venezuela. “I’m really thankful to have the cohort that I have [in the Architecture program],” Pellegrino said. “Without them, I don’t know if I could have gone through the experience.” Pellegrino will be completing the program in June 2019. She explained that her military experience made her a better team player and improved her time management skills, but it was a difficult transition going from a regimented lifestyle to one that encourages creativity and experimentation. She hopes to focus more on the social aspect of architecture when she graduates. 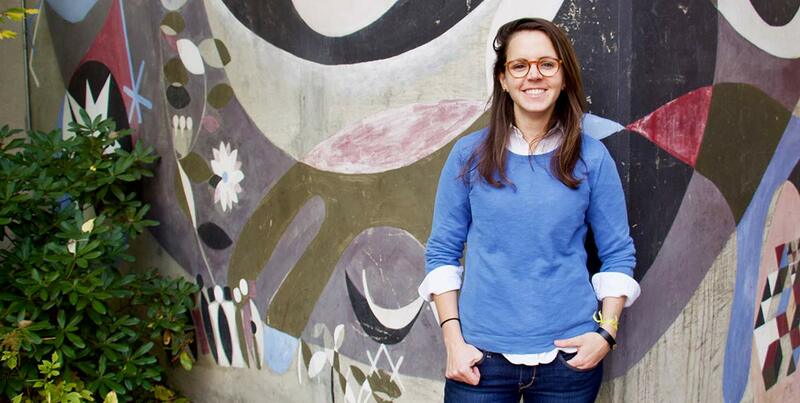 “I have this romantic idea of wanting to go back to South America and work for a local architecture firm that focuses on social problems,” she said. Right away, he moved to Japan. “Growing up in a small town in Oregon, that’s about as far removed for a country boy as could be,” Nielsen said. He was not only a CH-47 Chinook helicopter pilot, he was also a pilot in command, responsible for teaching younger pilots the tricks of the trade. Nielsen did several combat tours, in Bosnia, Egypt, Iraq, and Afghanistan. While his experience in the military was highly technical, dealing solely with facts and numbers, he likes the creativity the Landscape Architecture program offers. “I get to draw. I get to create. I get to use both sides of my brain,” he said. Kristin Reagan joined the United States Marine Corps when she was 19. She was a diesel mechanic and worked in motor transportation for four years. A few years later, she did tactical communications in the National Guard for two years. Reagan said being one of the few women in the Marine Corps at the time was very difficult. “However, I have a lot of gratitude from the things I was able to do and overcome,” she said. Today, Reagan has a bachelor's in kinesiology, a master of business administration, and a master's in sports management. “One thing the military taught me is to embrace diversity on a whole new level,” she said. “It’s taught me personally a lot about acceptance and inclusion of everybody, because we are all there for the same reason. We’re all on the same team." McNamara knew he wanted to do something in sustainable design or alternative energy after he left the military. The Memphis, Tennessee, native had spent more than nine years on active duty in the Marine Corps and two years in the Army Reserve. During his service, McNamara lived in Okinawa for three years and worked as a helicopter mechanic. 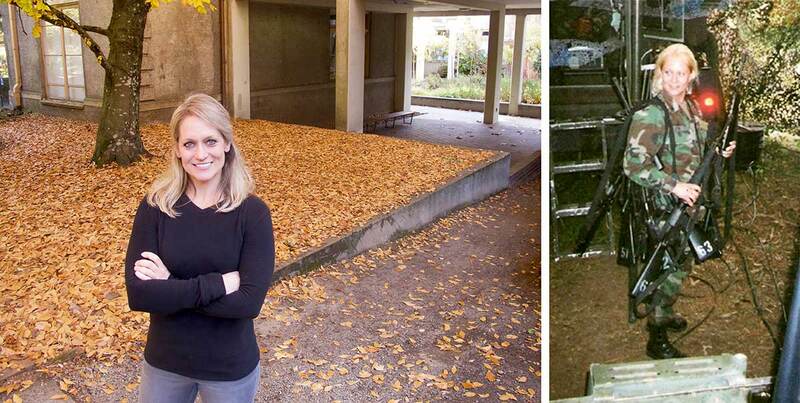 The first-year undergraduate student only left the Reserve a few months ago to attend the University of Oregon. His advice for civilians? Don’t just say thank you for your service, have a conversation. “The best thing someone could do for Veterans Day is talk to a veteran,” he said.